Bulby iphone ipad ipod touch puzzle app. 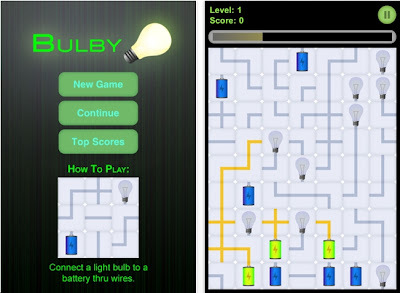 Bulby is one of those puzzles that require aligning the battery to the light bulb. Click on individual square and they will rotate in place. Doodle Quadro is fun! Look for any sized rectangle within the grid that has each corner the same color. The bigger the rectangle, the more points. A timer keeps the pressure on. Things I'd like to change: the colors are difficult to distinguish. Better contrast would help. Also, when time expires, a valid rectangle that does have each corner the same color should flash to indicate that yes, it was possible. Globs is almost identical to Floodit and several other versions. The graphics are much cooler. 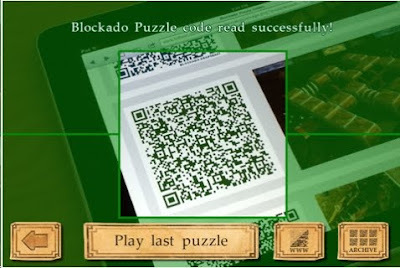 The game starts with the image on the left. You are the orange dot in the upper left corner. Click on the red circle at the bottom and you turn red and absorb any red dots adjacent to you. This concept has been utilized many times, but it's still fun! Since it's free, give it a shot. Vanish 10 is perfect for kids. Tap on the numbers that add up to 10 - quickly! The easy grids require paired numbers. Other challenges require groups of 3 and 4. Hey, it's free, so try it! At last year's International Puzzle Party, held in Osaka, my friend Pantazis Houlis showed me his hypercube puzzle made of antennae. Read this article. He's about to make millions! 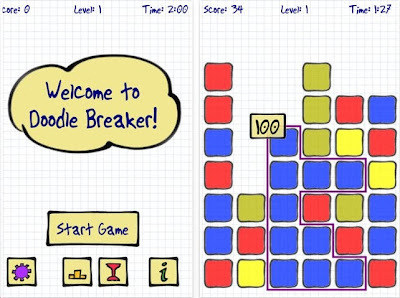 About 15 years ago I was addicted to Blocks. At least that's what I think it was called. I've seen numerous versions of this. 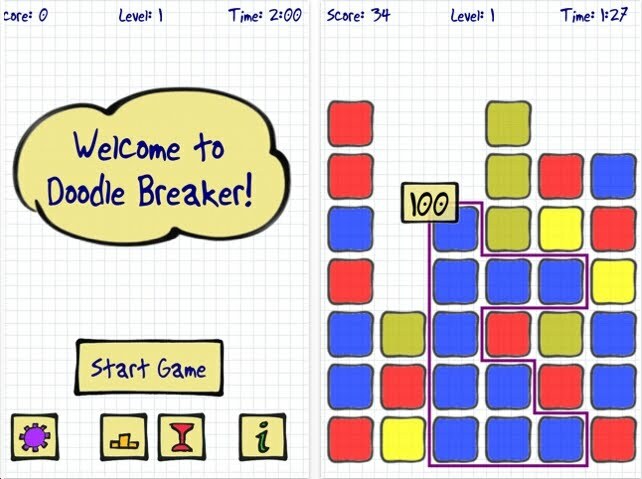 Doodle Breaker is a very charming version developed by Susanne Hofer. Clear the board by tapping on tiles that have the same color and are adjacent. 2 tiles will score 1 point. 3 tiles will score 4 points. Obviously, it pays to get a giant cluster rather than dividing it into smaller clusters. There's a free version, so definitely download it and get re-addicted. I received some 20 emails last night wondering why I did not post yesterday. Sorry kiddos, I had Federal Jury Duty. Longtime followers know that I've been on a mission to complete all 403 levels of Mortal Coil. Right now, I'm at 306. Why am I mentioning this? Because there's a new puzzle app that's very similar: Full House by Charles Chapman. 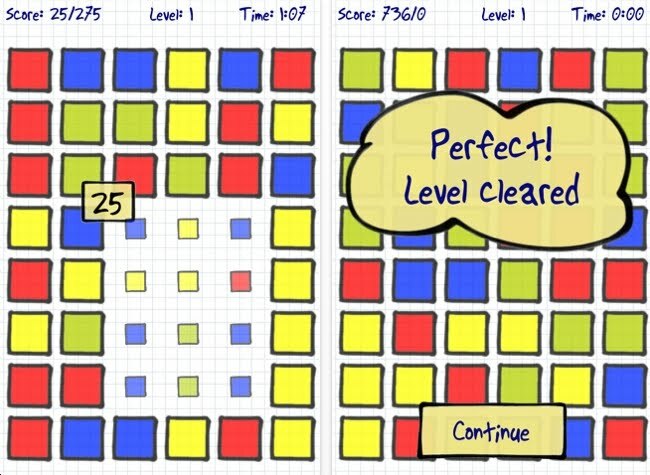 There are only 54 levels, however, that's a manageable number to complete and still maintain ties to the outside. 2 very interesting features: a puzzle level can be solved using a 5x5 grid or a 6x6, 7x7 or 8x8. The solving pattern will be very similar. Also, there is an auto element. 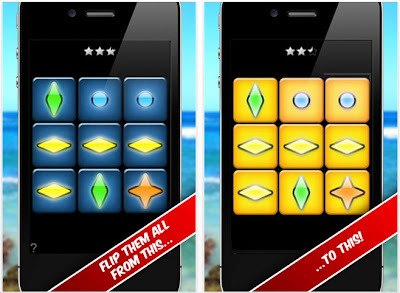 Select the starting square, then tap in 1 direction. It will make all the 'must' moves for you. Note to Mortal Coil developers: definitely add that. 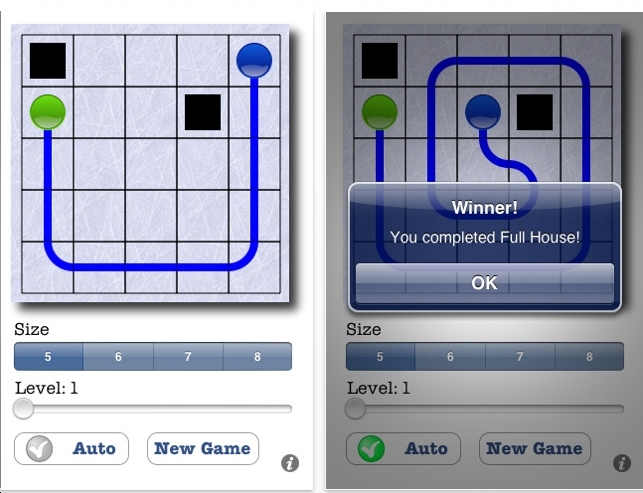 If there's 1 shortcoming about Full House: it's not possible to keep track of the puzzles solved. This is a must, so Mr Chapman, please add this. $.99 is a darn good price! Finally! The Museum of Math will open soon. My puzzle friend George Hart is one of the driving forces behind this. Look for my article about him in Games Magazine September 2009. In the meantime, read about the museum at the NY Times. 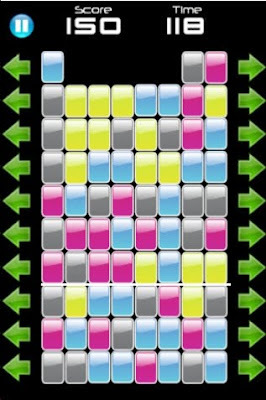 When I saw the icon for this puzzle app I thought: Oh no, not another puzzle where you slide the horizontal and vertical axes to align the columns. 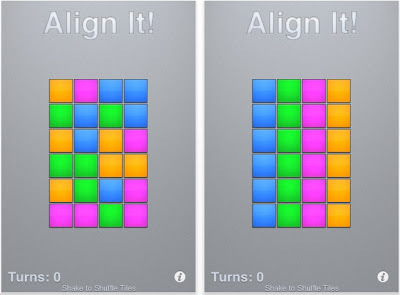 The object is to align the columns, but the mechanism for changing the tiles is completely different. Pay attention kiddies. 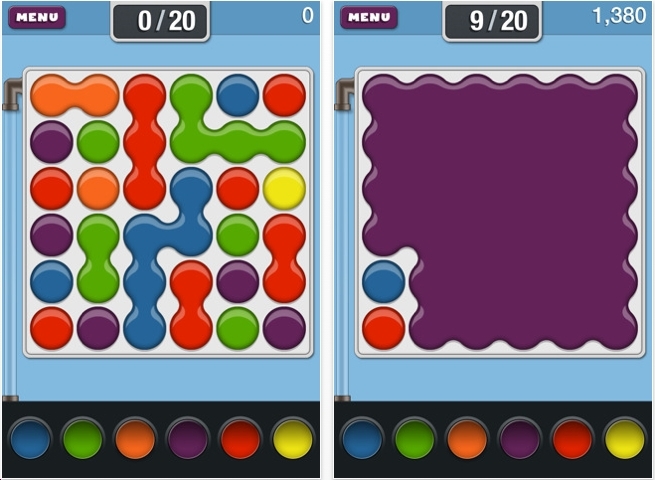 Tap on 2 adjacent tiles - then tap on two other adjacent tiles and they will swap. Note: each pair of tiles must come together to form a square or a single row or column. You can swap 1 and 2 with 3 and 4. Or 1 and 5 with 2 and 6. Or 1 and 5 with 6 and 2. This last swap is different from the previous swap because the 1 will go to the 6 place. Align It! was invented by R.B. McKenzie. There is a free version, so definitely give it a shot! 100! is very similar to The Knight's Tour. The object is to fill the grid with the numbers 1-100 following 2 rules. Moving horizontally or vertically: skip 2 squares. Moving diagonally, skip 1 square. It took me forever to realize that you must start in one of the center squares. And the rules I just typed weren't written either! Give it a try! Rudi Pio Loco Boscariol is the game designer. The number of permutations for Rubik's Cube is something like 4 quadrillion. And yet, back in the 80's, somebody proved that any position could be solved in 27 moves. That number has come down over the years. Now, it's 20. Read this article about higher order cubes. We've seen so many versions of Lights Out. Tiger Electronics sold 3 versions - all of them superb. Flip Them All is a terrific version. The object is to turn the tiles from blue to orange. The green icon points up and down. Tap on it and it will reverse the color of itself and the ones above and below. The yellow changes itself and the ones on the right and left. The orange changes itself and the ones up and down. The blue dot changes itself only. The red square (not in the image above) changes itself and all the surrounding tiles - including the diagonals. Down load this for free to solve 3x3, 4x4 and 5x5 grids. 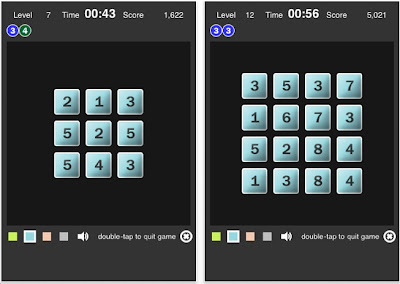 Neville Attard and Sven Neuman authored this fine puzzle app. Blockshift is a puzzle game where you score points by lining up 4 tiles in a row or column. Tap on the arrows to shift individual rows. Michael Webb is the author. He's also created a game called Stick Man Vs Zombies which sounds very appealing. Blockshift is not a pure puzzle app. Good for kids! We have seen sooooo many versions of Rush Hour by Nob Yoshigahara and Harry Nelson. Almost all of them are, frankly, rip-offs. 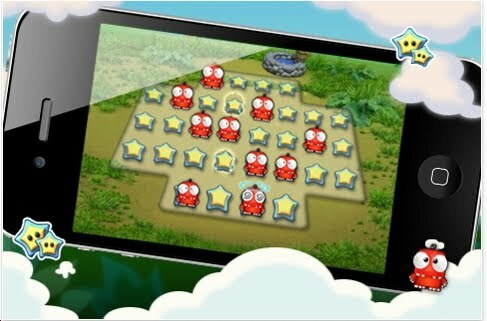 Blockado Jungle is similar to Rush Hour, but it is refreshingly innovative! 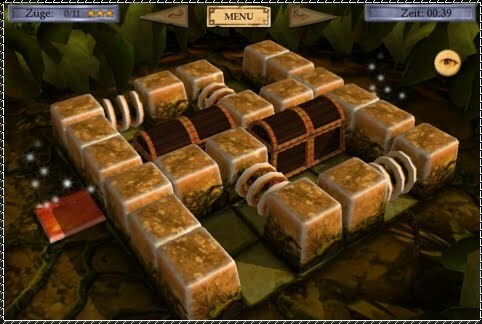 The object is to get the treasure chest out of the grid. 1. On some puzzles, there are multiple treasure chests to move. 2. The grid size is not always 6x6 and the exits for the treasure chest vary! 3. Some pieces have bridges. Therefore, another piece can pass under it. 4. Some pieces have springs - these puzzles can be very challenging. 5. Make your own puzzles. Look at the second image, above. 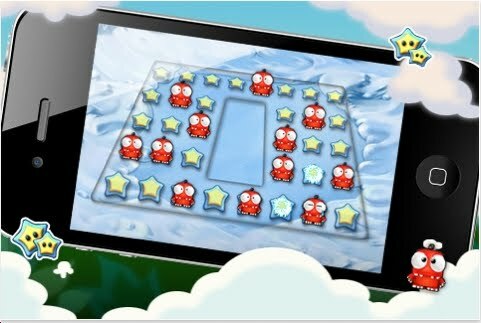 Users can create their own levels and upload them on to the website for others to download. I have solved almost all of the puzzles. One of them: I'm convinced is impossible. It's one of the spring puzzles. 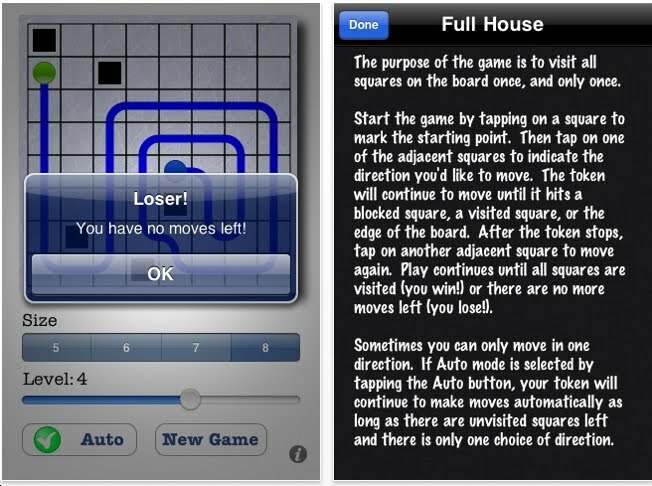 Daniel Matzke and his team have done a terrific job creating a fun, intelligent set of brain teasers. Now: let's hope the puzzle community steps up and creates their own set of hundreds more puzzles. 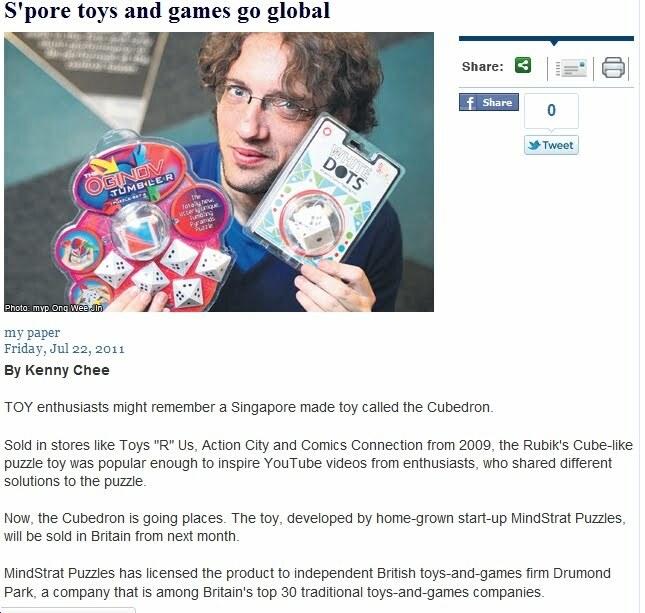 2 years ago I wrote an article for Games Magazine about Artifact Puzzles. Maya Gupta is the proprietor. I get the feeling it's a 1-man operation. 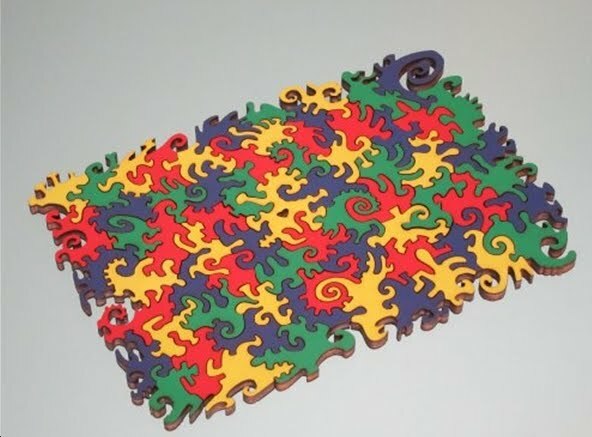 The wood puzzles are laser cut and some of the pieces are funky! Yesterday the UPS man delivered an unexpected parcel: a special 'no-picture-on-the-box' jigsaw. It came at 2:30 & I dropped everything & did it in about 2.5 hours. I know what you're thinking: jigsaws are not cerebral. Normally I focus strictly on the brain puzzles. However, Maya's jigsaws are just so much fun! Confession: I bought 3 of these jigsaws to give to my siblings' families for Christmas but solved them myself first! 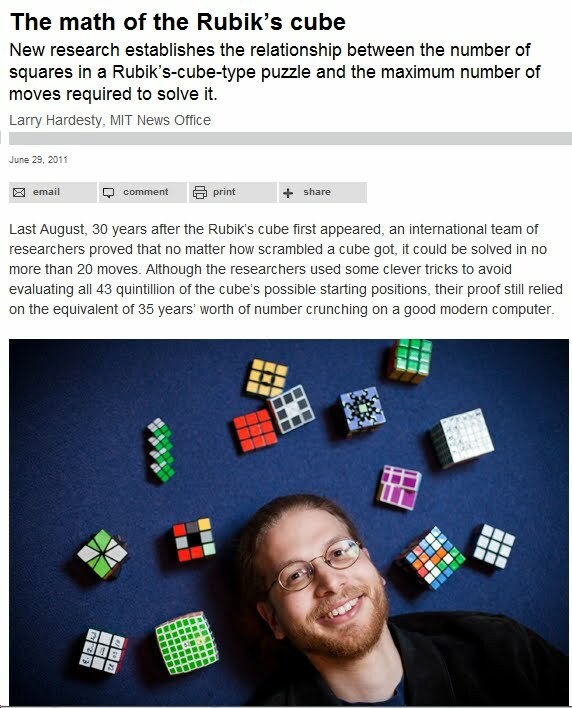 There is a 4-page article describing Oskar van Deventer's Over The Top 17x17x17 Cube Puzzle in the September 2011 issue of Games Magazine. It is on the newsstands right now - for the next 2 weeks or so. Games Magazine can be found at Barnes and Noble, Borders, Target and other stores that carry a lot of magazine titles. Because I am the Mechanical Puzzle Correspondent for Games Magazine, I was assigned the task of covering this story. Games Magazine has a minimal presence on the web: they don't post articles or puzzles and they often don't update it in a timely manner. Buy your copy today! Bring it to the next International Puzzle Party or New York Puzzle Party Symposium and get Oskar and myself to autograph it. 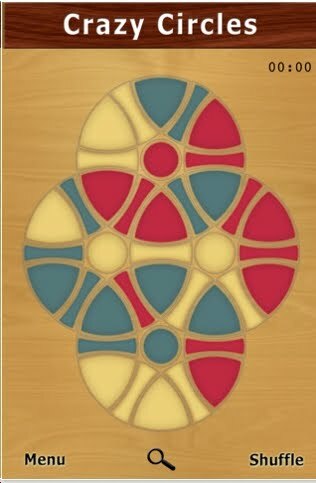 About 25 years ago, I found Doug Engle's Circle puzzles - flat versions of Rubik's Cube. I thought I understood the puzzles completely. Then Doug came out with puzzles where the orientation of each piece mattered. Click here for some examples. Vishnu Chaitanya Pedasingu has now come out with a nice set of versions of these puzzles. Good interface. Try the free version. 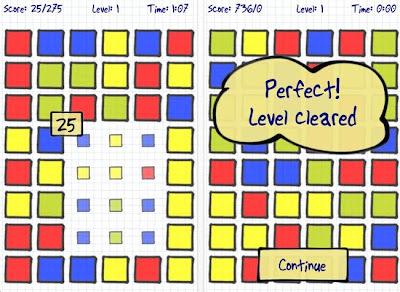 Pet Jump is a solitaire peg jumping puzzle app. 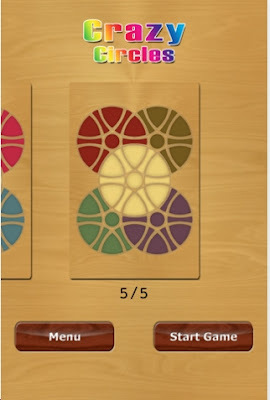 There are 3 different game boards. Notice the second image above. I think that's a unique board for this genre. However, I got stuck on the 6th or 7th level. I think that level was made incorrectly! This is free! So give it a shot. Leo Guo is the app designer.